You enjoy cooking, but you don't have too much time to devote to it. So you're wondering whether to get a couple of these specialized cookers (like a slow cooker, pressure cooker, rice cooker, etc.) to help you prepare healthy and delicious meals without requiring too much of your time. Well, you might not have to get a slew of cookers after all: a multi-cooker might be the answer! It saves money, as one has to buy only one cooking utensil instead of many different types. It saves space in your cupboards as you have to store only a single cooking utensil instead of a number of them. This is great for small kitchens where cupboard space is scarce. It also saves cleanup work as you don't have to dirty a number of pots. It has built-in and simple to invoke push-button cooking programs that eliminate the complexities of cooking by regulating temperatures and cooking times as required. There are many of multi-cooker brands out here. But being complex multi-function products, very few offer the top quality, features and durability you would expect as a good cook. Instant Pot IP-DUO60, Fagor 670040230, and Cuisinart MSC-600 are no doubt among the best multi-cookers you can buy today. Not only are these extremely popular, but, at the time this article was received, they had received excellent reviews from Amazon customers who have used them: an average rating of at least 4 stars (out of 5 stars) for each of them. In this article, we will compare multi-cookers Instant Pot IP-DUO60, Fagor 670040230, and Cuisinart MSC-600, and we will provide detailed descriptions as well as recommendations. Instant Pot IP-DUO is also available in 5 and 8-quart capacity sizes. Cuisinart MSC is also available in 4 and 7-quart capacity sizes. When you click the product links for Instant Pot IP-DUO and for Cuisinart MSC in the Amazon section below, you will be given a choice of capacity. Even though the inner pots of all three products are removable and dishwasher washable, the removable inner pots that come with Fagor and Instant Pot do not have handles, and therefore are not suitable to bring to the table for serving. Cuisinart multi-cooker allows setting the exact desired cooking temperature, up to 400°F. Fagor multi-coooker provides two cooking temperature selections for the slow-cooker mode (low and high). All other operation temperatures are internally set and cannot be modified. ​Instant Pot provides 3 temperature selections for browning/sauté mode and 3 temperature selections for the slow cooker mode (low, medium and high). All other operation temperatures are internally set and cannot be modified. Note that though all three cookers allow you to set the length of the cooking time. However only Instant Pot and Fagor provide a delayed cooking feature. Instant Pot is equipped with dual pressure settings: High (10.2 ~ 11.6psi) / Low (5.8 ~7.2 psi). High pressure reduces cooking time by up to 70% and low pressure avoids overcooking delicate food. Fagor also has dual pressure settings: High (9 psi) / Low (5 psi). Cuisinart MSC-600 does not have pressure cooker functionality, but if you are looking for a Cuisinart electric pressure cooker you can always consider the Cuisinart CPC-600AMZ (see Amazon products section below). The Cuisinart cooker and Instant Pot both come with a steaming rack. There is no explicit steaming function on the Fagor, but by using a steaming basket which is not included, the 6 minute rice cooking mode of the Fagor can be used to steam foods as well. Browning is best controlled by the Cuisinart cooker which allows increasing and reducing the cooking temperature as desired. Fagor cooker does not allow temperature settings for browning. It provides three fixed temperature selections for browning. Instant Pot provides also three temperatures selections in browning/sauté mode. All three cookers will go automatically into keep warm mode after the cooking has completed. The cookers can also be set manually into keep warm mode. Fagor cooker is equipped with a self-locking lid. The lid will not open while there's pressure inside the cooker. There are also two independent pressure control valves and anti-overheating protection for added security. With all three units, all parts that come in contact with food are BPA free. So which multi-cooker is best for you? 1If you are looking for pressure cooking or rice cooking modes as part of the functions offered by your multi-cooker, then you should get either the Instant Pot or the Fagor, as the Cuisinart does not offer these functions explicitly. But of course, you could still cook rice with the Cuisinart by controlling the cooking using appropriate timer and temperature settings. 2If you are looking for browning/sauteing cooking modes as part of the functions offered by your multi-cooker, then you could get any of the three, but with the Cuisinart, you can control better these functions by increasing and decreasing the temperature as required. Instant Pot cooker provides a choice of three cooking temperatures for sauteing/browning. Fagor's browning/sauteing cooking mode does not allow setting temperatures. 3If you are also looking for a yogurt making mode as part of the functions offered by your multi-cooker, then you should consider the Instant Pot. The other two cooker do not offer this function. 4If you are looking for an explicit steaming mode as part of the functions offered by your multi-cooker, then you may want to get the Instant Pot or the Cuisinart. Both multi-cookers even come with their own steaming rack. There is no explicit steaming function on the Fagor, but by using a steaming basket (not included), the 6 minute rice cooking mode of the Fagor could be used to steam foods as well. 5If you are looking for a stainless-steel inner pot because you don’t like non-stick coatings, then you may want to consider Instant Pot. The other two cookers come with aluminum inner pots with non-stick coating. 6The digital display on the Fagor and Instant Pot multi-cookers displays only timer data. Temperature is not displayed and can not be explicitly set. You can only choose certain specific temperatures as explained in Table Note 2 above. On the Cuisinart cooker, both timer and temperature is displayed and can be explicitly set. 7Instant Pot and Fagor multi-cookers' removable pots do not have handles, so they cannot be used to serve at the table. On the other hand, the Cuisinart muti-cooker's removable pot has stay-cool handles and can be taken to the dinner table. 8If you like to cook longer and larger cuts of meat, then the Cuisinart is more suitable. 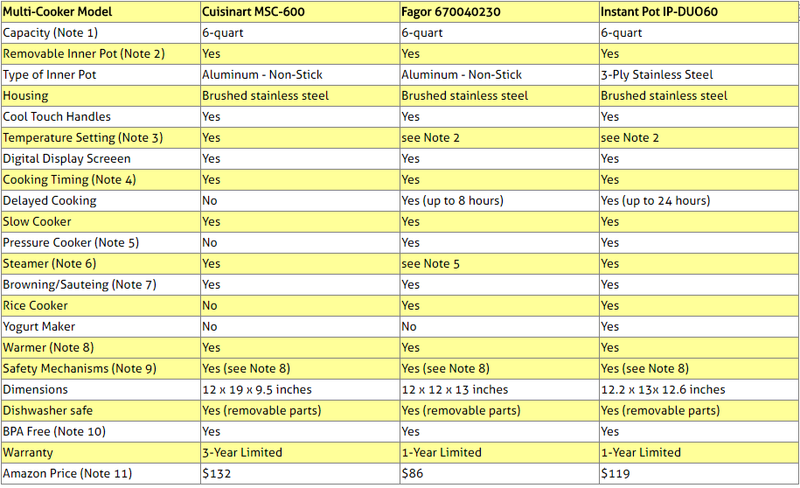 The Cuisinart pot is 19" long, while the Instant Pot and Fagor inner pots are respectively 13" and 12" in diameter. 9Even though all three cookers allow timed cooking, only Instant Pot and Fagor cookers are equipped with delayed time cooking functionality. The Cuisinart unit's timer can only be used to set the cooking duration. 10Finally, if warranty is important to you, note that the Cuisinart unit comes with a 3-year limited warranty, while Instant Pot and Fagor come only with a 1-year limited warranty. In conclusion, because of the large number of functions it offers, because of its stainless steel inner pot, because of the large number of safety measures it has built in, and because it is so easy to use and obtain excellent results, our number one choice is the Instant Pot multi-cooker. Note also that Instant Pot has a more recent model with all the features described above and that supports Bluetooth, allowing programming and monitoring from smartphones or tablets (please see Note III in Amazon products section below for more info). You will find below on Amazon the multi-cookers compared here. Please click your selected product to check the price and additional information. When you click the product links for Instant Pot IP-DUO60 and for Cuisinart MSC-600 in the Amazon section below, you will be given a choice of capacity. ​Note: Amazon often provides a good discount on the List Price of sold products. If a discount is available, the List Price and the actual Amazon price will be shown when you click the images below.